This weekend I hiked the Applachian Trail with friends. Because they’re insane, they hiked 40 miles…in one day. Because I’m not insane, I joined them to hike 8.6 miles. One of my hiker friends loves lemon. I once saw him down 8 lemonades at dinner. So when I saw these new Oreos, I had to bring some on our hike. 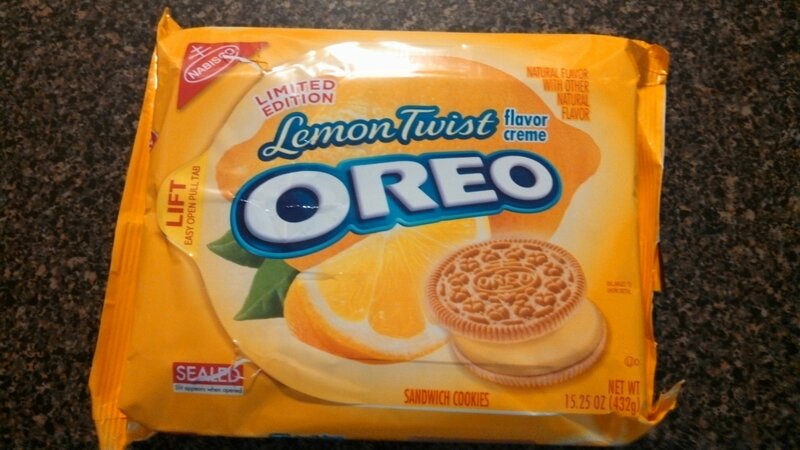 Lemon Oreos…not the new weird Watermelon Oreos. Worst case scenario, we could drop them on the trail to attract bears find our way back to the car. 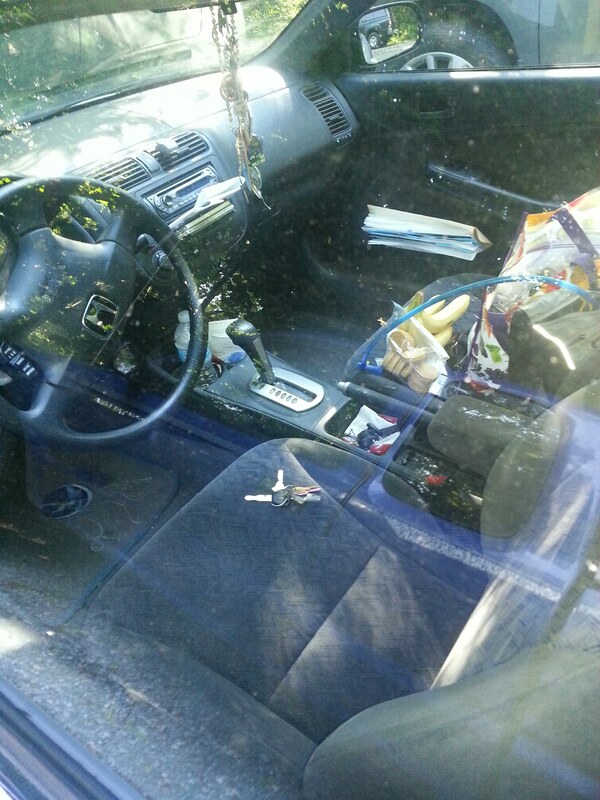 Water, bananas, and cookies in the passenger seat with keys in the driver seat…of a locked car. So we hiked away. Our mouths watering at the thought of the lemon Oreos we had to leave behind. 8.6 miles later, Kiefer picked me up, brought a spare key, and returned me to my car. I ate warm lemon Oreos the whole way home, and they were delicious. I should have added more sprinkles. Because after hiking 8.6 miles, you can eat whatever you want without feeling guilty. The day I moved in with Kiefer was a day of many firsts for our relationship. Mostly for him. My extremely mature response may have involved chasing him around while tossing tampons at him. Kiefer: There are bras hanging from the curtain rod. Me: If you prefer, I can lay them out flat on the dining room table. I told Kiefer I would do all of the laundry if he would do all of ironing. He agreed, thinking he was getting a good deal. Kiefer: Why are a gazillion of your tanktops in the ironing pile? Kiefer: Is this a pair of shorts, too?! I’m a fairly neat person. Especially in the kitchen. No dishes are allowed in the sink. Ever. The other day I tried to make Oreo Truffles. Except the melted chocolate was giving me trouble. Kiefer: Know what would cheer you up? 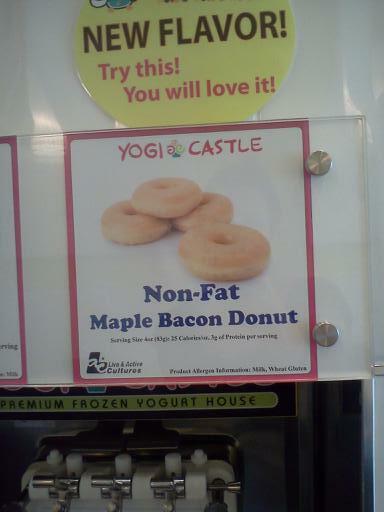 Yogi Castle. Me: I don’t want any. Your blog is Freshly Pressed. It’s not the zombie apocalypse…yet. 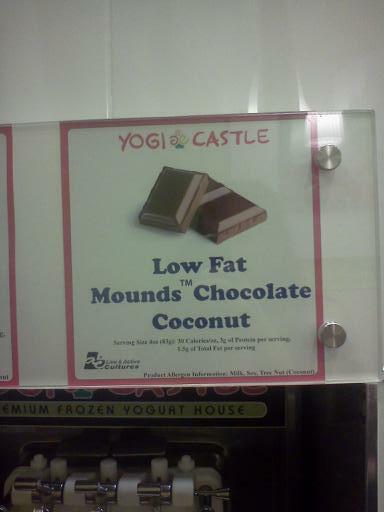 Yogi Castle, the greatest frozen yogurt place ever, is following you on Twitter. That’s right: Yogi Castle is following ME on Twitter. Someone there knows all about the Yogi Castle Chronicles. Okay…so maybe I already celebrated. And for you weirdos freaks other people who like bacon in your dessert, there’s something for you, too. So many of the comments on the last post were hilarious. Also check out Ellie Ann’s, and Laurie’s, Queen Gen’s, and Vesta Vayne’s comment thread, which starts here. 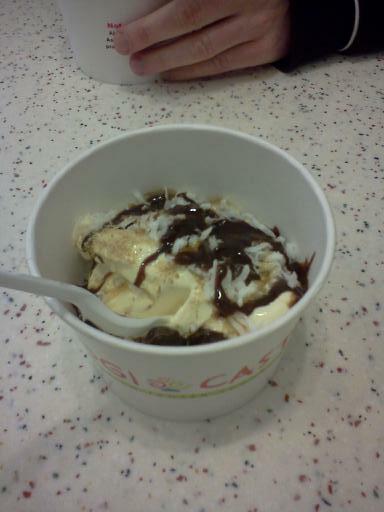 Ddot and I went to Yogi Castle the other day. 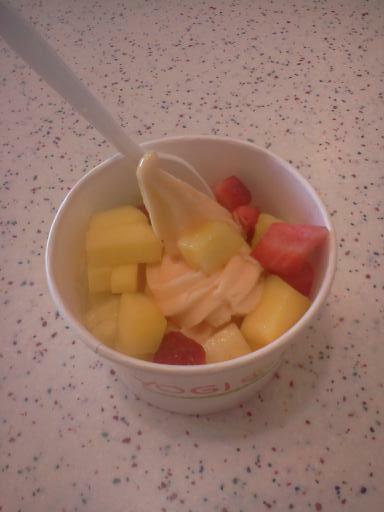 Which frozen yogurt do you think is mine, and which do you think is Ddot’s? If you think A is mine, you’re stupid obviously, you’re new here. You should probably read this post on acceptable chocolate to fruit ratios. Basically, it says you should always have more chocolate than fruit. Or, if you’re like me, always have only chocolate and no fruit. 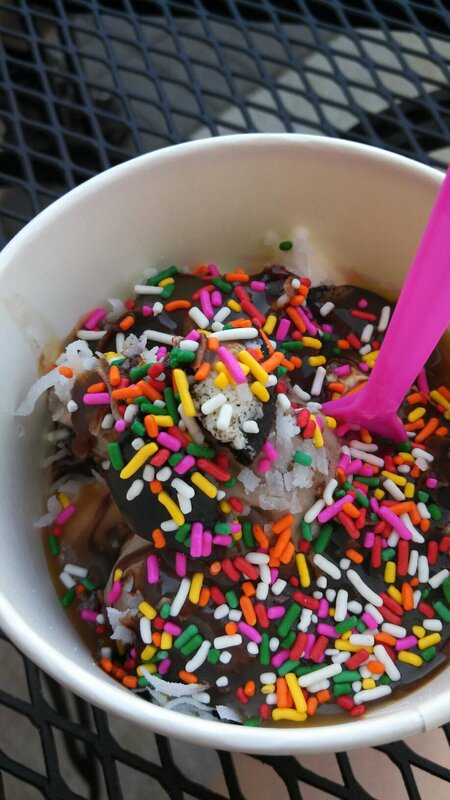 Moving on to the next order of business…Frozen Yogurt for Breakfast: For or Against? Yogi Castle now has Fruity Pebbles and Captain Crunch as toppings. Who knows how long they’ve been there. I usually only notice chocolate stuff. 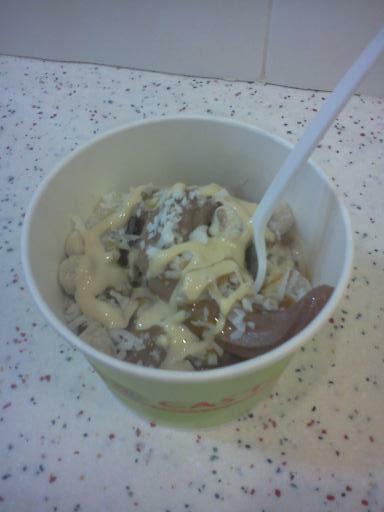 It seems misleading to have cereal as toppings. I can’t go there for breakfast anyway because Yogi Castle doesn’t open until 11. I know this because I spent Sunday morning pressed up against the glass drooling and clawing until my fingers bleeded bled. What’s your favorite topping? Why doesn’t Yogi Castle have broken Pop-Tarts as a topping? How much longer should I put up with Ddot’s chocolate vs. fruit disrespect? This is my greatest creation yet. It’s going to take a miracle for me to try something else. So pray for a miracle…in a week or two…I need time with this deliciousness first. In the background is Kiefer’s hand. He’s gripping his frozen yogurt because he’s afraid I’ll steal it, which is totally ridiculous. 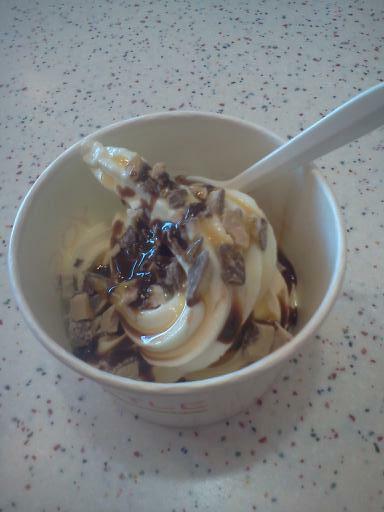 I would never steal anyone’s yogurt…especially his because he probably put mint in it.